Lagos State All Progressives Congress (APC) governorship candidate, Mr Babajide Sanwo-Olu, and his Peoples Democratic Party (PDP) counterpart, Mr Jimi Agbaje, on Friday differed on infrastructure, health and other issues critical to the development of the state. 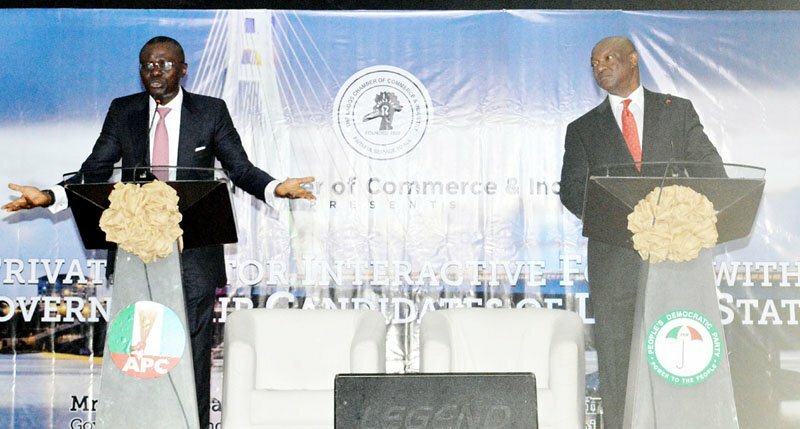 The candidates spoke during the Lagos Chamber of Commerce and Industry (LCCI) Private Sector Interactive Forum with governorship candidates in Lagos. Addressing issues of traffic and transport management, Sanwo-Olu said that government was a continuum and vowed to continue all projects started by his predecessor for the benefit of citizens. He said that his plan for traffic was holistic, from road repairs and construction to opening up more means of transportation through waterways and rail, to training and empowerment of traffic officials. “For years during the PDP rule, we asked the Federal Government for access to the existing railway corridor, but it was denied. This led us to create the Blue line railway from Okokomaiko to CMS. “We need to complete the track because Lagos needs a transportation system outside roads that can move thousands of people daily,” he said. Responding, Agbaje said that for 20 years of APC governance in the state, residents were still grappling with traffic congestion; especially issues with trailers parked on bridges along Costain to Apapa. “Lagos is one of the two mega-cities of the world that does not have a multi-modal transportation system. It is time we start thinking of multi tiered roads; the world is moving, we cannot afford to be different. “The rail project has been on for too long. We need to have big ideas to address problems that are peculiar to Lagos. “The way things are presently is not sustainable and it has failed to deliver the sort of impact in the lives of ordinary citizens that should be expected from an economy of Lagos’ magnitude,” he said. Agbaje said that the sort of development that Lagos requires should be anchored on improving liveability, expanding the economy and retooling it for the 21st century. Sanwo-Olu promised to take the state away from the national grid. He said that within six months of his assumption of office, he would deliver about 1000 Megawatts of power supply to the State. He said with about 2000 Megawatt of consistent power supply, the power needs of Lagosians would be solved. Sanwo Olu said that a well thought out regulatory and legal framework is strategic to drive Public Private Partnership (PPP) operations in the State, stressing that when elected, he would deploy global best practices in the engagement of the OPS. He said that he would partner with distribution companies to ensure they upscale their power supply to the state, noting that prepaid meters would be provided to residents to ensure accountability and transparency. However, Agbaje said he would improve power by 1000 megawatts within his first 18 months, and encourage investment in embedded power projects toward enhancing power supply. Speaking on health, Sanwo-Olu noted that the Lagos Health Insurance Scheme would ensure access to affordable healthcare and help build a health care structure to be proud of. On his part,Agbaje criticised the present Health Insurance Scheme, saying making it mandatory was another form of taxation that has been making life difficult for the masses. He said his administration would have significant developments in health, waste management, education, transportation management and in making use of technology to solve problems. Agbaje promised to develop “an ocean economy” and a knowledge driven economy” to enhance the economic well-being of the state and its citizens. Besides, Sanwo-olu said that his administration would be innovative about Internally Generated Revenue (IGR) in a way that would not exert pressure on the citizens. He noted that the private sector remains the engine of economic growth and would continue to create an environment for the private sector to thrive in the state. “As a former Commissioner for Commerce & Industry in Lagos, I know that proper collaboration with the private sector leads to more job creation, improved industrial harmony and boosts investment,” Sanwo-Olu said. Mr Babatunde Ruwase, President of LCCI, said that engaging the candidates would give exposition that would guide the private sector’s electoral choice. He said that the quality of political governance has profound implications for investment environment. Ruwase said without a conducive business environment, there cannot be meaningful economic progress.